Graduations, for me, are fun to shoot. In any given moment or spread of shots there is whatever emotion you might imagine and there are all ages to pick from. Thankfully, it seems that nowadays, the ceremonies are short and its common that there is a lot of comedy. The OC Register called with the Dana Hills graduation assignment early in the week and then because of someone getting sick I got the El Toro graduation at the last minute. The shots for the Dana Hills High School went in the paper and on line but the story I wrote got lost and didn’t make it, lost in the system, so I include it here. I wrote a story for El Toro as well and I think it went in but will have to check and post it here after 30 days. I almost didn’t make it as the Dana Hills Graduation was barely over when the El Toro Graduation was just starting. The event was at The Bren Center on the UCI campus. Five dollars for the toll road and another seven dollars for parking. I should have flashed my press pass to see if they would waive the fee but usually it means a phone call, the standard back an forth, and there was just no time. Last year at The San Clemente Graduation I shot the cap toss with my wide angle and I was anxious to shoot it again at Dana. I got in position to shoot it and its an okay shot and will look great blown up but caught something I was doing wrong and now I will have to wait an entire year to try it. I was going to try it at El Toro’s graduation and it would have been great but I got pulled off the floor by the protocol police because “…The Register knows we don’t allow photographers on the floor…” Whatever. DANA POINT(CA. )-Beaneath a sea of Dolphin blue caps, the Dana Hills High School Class of 2009, 686 smiling faces in all, sat patiently on the football field in the bright Thursday afternoon sun. Acknowledging the hoots, hollers and shouts of congratulations from family and friends in the stands, one by one, each graduate stood, waiting to receive their hard earned diploma. A short walk to the podium, a photo and back to their seat, with a diploma was all the time it took if you don’t count the four years it took to get there. Max Kelley, Associated Student Union Vice-President commented that the last four years had been a time of change, highlighting the fact that as freshman there was no FaceBook or even U-tube. Kelley encouraged his classmates with the idea that with change comes experience and opportunity and together they should look forward to what opportunities the world has. “We can do anything we want…(we have) an unlimited opportunity to make our life meaningful…” Kelley said. Jeremy Chang, as the Dolphin Scholar of Scholars used the movie “Risky Business” with Tom Cruise as a lighthearted example of how to accomplish a goal and at the same time challenged the Class of 2009 to examine and rethink their values. “I encourage everyone to consider the well-being of others…”Chang said. Graduating students, brother and sister, Rory and Megan Weinell, spoke together and brought laughs from students and faculty with props and comments, including a kitchen rolling pin meant to be a scroll of past commencement speeches at elementary and middle schools and one (hopefully) from their presumed future at Yale. They bemoaned their job opportunities in the light of the present economic crisis. “There is no hope of finding jobs because they’ve all been taken by the Dana alumni…” Megan Weinell said. After the official acceptance of the Class of 2009 by faculty and staff, the students wasted no time to throw their caps into the air accompanied by the release of several dozen white doves. Family and friends where invited to join the graduates on the field with hugs, handshakes and a lot of photos. Alexis Kubicki will attend Orange Coast College to study illustration in the fall and was surrounded by family and friends, enthusiastically posing for photos in endless combinations. Kubiki’s mom, Lisa Smith qualified her daughter as the best artist at Dana hills, also commenting that she is beautiful inside and out while her father Marty Aahmes offered her some sage advice. 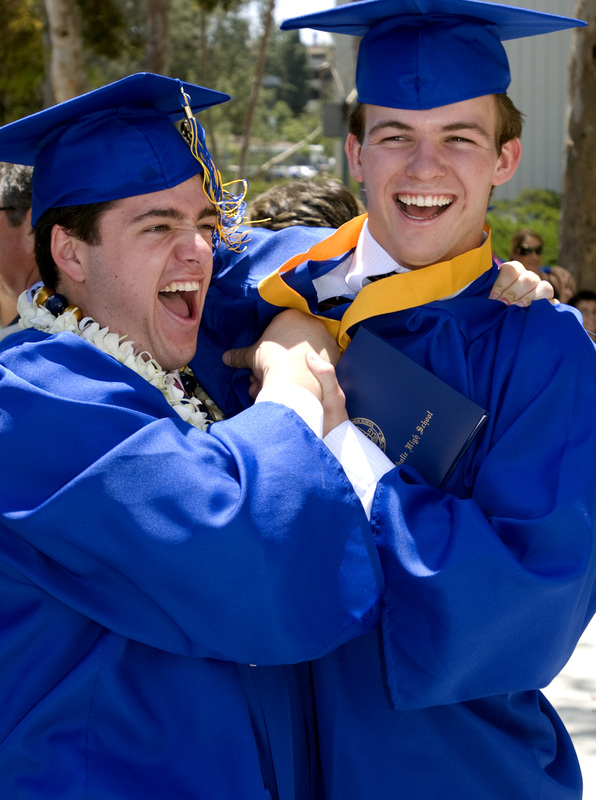 I shot the Santa Margarita Catholic High School Class of 2008 graduation ceremony on Saturday for the newspaper. It was held at The Bren Center at UCI in Irvine. I got there early and shot the kids getting ready outside, and the lineup to go in. Nervous and excited, they hugged, shook hands and smiled at each other. There were a little over 400 total graduates this year. It occurred to me that this will be the last time they will all be together in one spot again; a bitter sweet freedom, and if you have graduated from high school, you will instantly know what I mean. I imagined the photos I took today, printed in the paper, will find their way into more than a few scrap books and maybe a poster at the 20 year reunion. I saw these two posing for pictures with family and friends and having a great time defending themselves from jibes and jokes designed for funny expressions and the snap of a photo. They are best friends; one is destined for Notre Dame in the fall and the other is going to Holy Cross. A bright future shines in their eyes; the soft shadow of accomplishment spreads across those that surround them. The small concrete courtyard where they stand, smiling and leaning on each other, is not big enough for who they are now. Our timid awareness that most of the class of 2008 will not see each other again is relieved with these two. Amazingly, over their lifetime, they will become better friends. They are the sum of all the photos I have taken of the class of 2008. I see them both at each others wedding and both as the best man. I think they will most likely live close to each other and if not, I see a big phone bill from calling every day. Closer at hand, I foresee a summer roadtrip sometime in the next four years where they could not possibly imagine no one in the small Midwest towns they’ll pass through, will be able to recognize a roadtrip when they see one. They will attempt to break all the records of messy hotel rooms, cheap diners, brutaly red sunburns and staying awake the longest. They will have bags full of fun and talk about their trip for the next 60 years, even after their wives have long left the room. They will be the godfathers for each others children and they will send each other funny gag gifts on birthdays. They’ll share golf tips and become mildly irritated after discussing the merits of their individual favorite professional sports teams. They already know which of them doesn’t like ketchup or mustard or mayo or wheat bread. They will get to be 50 years old and wonder about how fast it’s all gone by while they stand with their sons and daughters for photos in a courtyard that is not big enough for them.